We design & service landscapes with your personal taste in mind. Great landscapes don't just happen - it takes incredible planning and work in the off-season. Let us work with you year-round and see the difference our experience can make! When you work with Mitchell Landscaping, you will benefit from our 10+ years of experience. 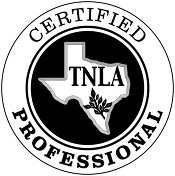 We are a Licensed Texas Irrigator, have a Texas Applicator's License, and are TNLA Certified. ML brings industry standards to the Texas Panhandle.